Walnut | SCS Hardwood Floors, Inc.
General: The heartwood is a light brown to dark chocolate brown, occasionally with a purplish cast and darker streaks. The sapwood is a creamy white. Walnut develops a rich patina that grows more lustrous with age. Generally straight grained, sometimes with a wavy or curly grain that makes a nice decorative pattern. Walnut produces a greater variety of figure types than any other wood. 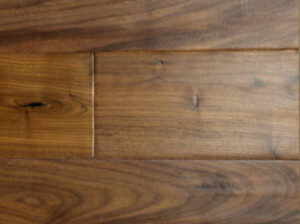 Walnut holds both paint and stain exceptionally well and can be readily polished. Walnut has a rating of 1010 on the Janka Hardness Scale. It is well known as being the toughest hardwood of medium density.